First place: Lionel Messi. Second place: Lionel Messi. Third place: Lionel Messi. Was there really going to be any other outcome when Barcelona asked fans to vote for the best goal in the club's history? Absolutely not. Perhaps not surprising when it is almost a carbon copy of fellow Argentine Diego Maradona's goal against England in 1986. Messi's effort against Athletic Bilbao in the 2014-15 Copa del Rey final picked up 28% of the vote, while his 2010-11 goal against Real Madrid at Santiago Bernabeu Stadium took 16%. All was not lost for players whose name is not Lionel Messi, though. Spain's Sergi Roberto took fourth place with his last-minute goal against Paris St-Germain in 2017, which saw Barca overturn a four-goal deficit to progress to the quarter-finals of the Champions League. 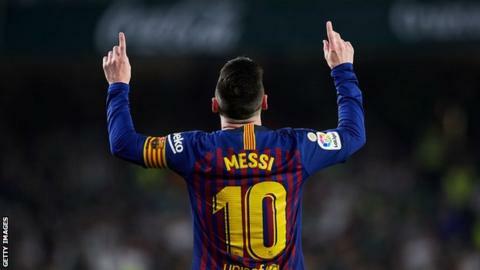 More than 500,000 votes were cast from more than 160 countries in Barca's competition, in which fans could pick from 63 goals. Ten of those were Messi's. Well, you've got to give others a chance, right?